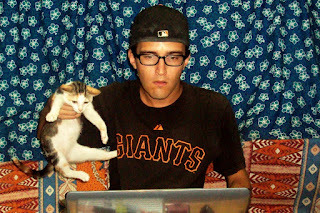 Matt's Samoa Blog: Yes! Giants! My dad texted me at 8:46 p.m. PDT with, “Giants win 3-2”. And just like that, my boys are going to the World Series for the first time in 8 years. This is glorious news, except for the fact I’m completely isolated from baseball. I’ve been wearing my Giants t-shirt to class and my Giants baseball cap around town, but the thrill of baseball isn’t about the jersey or the hometown pride; it’s about watching the game. And though it’s going to be decidedly difficult to do that, I’m going to try my damnedest. Looking at the game schedule, games 1 and 2 are this Wednesday and Thursday at approximately 2 p.m. Samoa Time. Then games 3 through 5 are Saturday, Sunday, Monday, and then, should games 6 and/or 7 be necessary, next Wednesday and Thursday. Sports Bar. There are 2 prominent sports bars in Apia: Henny’s and Wildfire. Each of these has ESPN Australia. Fox has domestic TV rights, but I suppose there’s a chance ESPN is telecasting the games internationally (or at least to Australia). Assuming that, and that they are open at 2 p.m., these places become viable options. Charges d’Affaires. The Charges gets the American Forces Network at her house, and I would definitely assume it will be showing there. Going to her house is probably not an option during the middle of the week, but it’s possible she’d allow a TV-less PCV to come watch the World Series next Saturday or Sunday. The American Embassy. They have cable that can be shown in the lobby. It’s unclear whether they get any channels that will be showing the World Series, but it’s certainly possible. They tend to be tight on security there, but I don’t think watching a game there would be out of the question. It’s definitely worth a try. GameDay Webcast. If worse comes to worst, I should be able to (ideally) watch or (more realistically) listen to the games over the Internet. When I lived in Pasadena I subscribed to MLB.com so I could listen to Giants games, and their web capabilities have only improved since. Watching a 3-hour game on LavaSpot would be expensive, and it’s unclear the LavaSpot would have the bandwidth to handle streaming video. These factors make this option a last resort. Do you live in the Apia area? Do you have a satellite dish or otherwise International TV capabilities? Can I come to your house to watch a baseball game at one of the following times? I would be willing to bring chips and soda and explain the finer points of Major League Baseball to anyone interested. Please email me here. 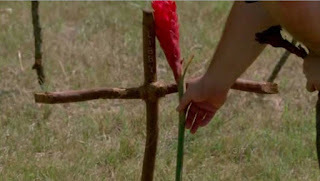 While watching Lost yesterday, I noticed Hurley put a Teuila blossom on Libby's grave. The Teuila is, of course, the national flower of Samoa. Note: Please refrain from leaving comments about Lost. Thank you. Oh no, from here on I might have to disagree with you--Go Rangers! So... where did you watch the game? also, have you tried KNBR online? possibly streaming radio there.